Editor’s Note: In this review we mainly reference the Pro 6000, but we have also included 6500 in the title because the two brushes are very similar — the only difference is that the 6500 comes with an additional brush head in the box. If you are short of time, the answers to the following 3 questions should let you know all you need to about the Oral-B Pro 6000 (view on Amazon). If we have missed something, let us know in the comments. 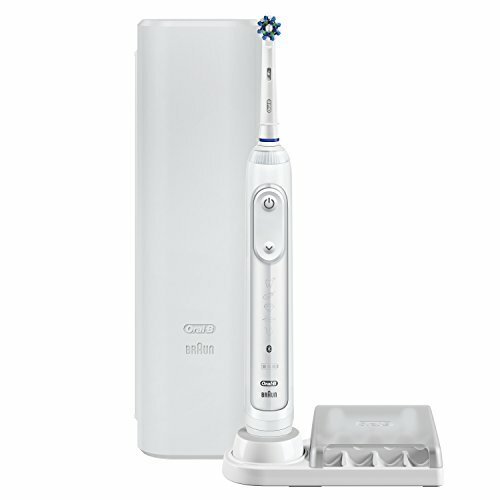 If you want more detail, you can read our full Oral-B Pro 6000 review further down the page or watch our video review. Definitely not. This brush offers a lot and is very capable. A good battery life a reasonable box contents, a number of cleaning modes and more, there are few things that you can fault about this brush. The best alternative to consider is the Genius Pro 8000. Essentially an upgrade on the Pro 6000 it offers an extra cleaning mode, a premium travel case with in case charging as well as options for mounting the smartphone. We rate it as the best Oral-B electric toothbrush. Alternatively if you want a brush that is a little simpler, not bogged down in features, the Oral-B Pro 1000 is a solid choice for fantastic everyday cleaning. 3. Where is the best place to buy the Oral-B Pro 6000? You should find this brush available from most US retailers. We have included a live price comparison below, and it’s always worth checking for deals on eBay. Most of the time, unless another reputable supplier is cheaper we recommend Amazon as they are always well priced and deliver promptly too. The Pro 6000 is one of Oral-B’s ‘smart’ toothbrushes. What this means is that the toothbrush can via an app on your iOS or Android smartphone connect to your phone for real time tracking and logging of your usage. Oral-B have been doing this for a good few years now, but in the last 12 months there has been a big push with more models now featuring such and more consumers asking for this. The Pro 6000 is an updated, slimmer and more stylish alternative to the Pro 7000 that is and has been so popular. Named the Pro 6000, you may also see it referred to as the Smart, SmartSeries 6000 or even the Genius 6000. Oral-B do at times release different versions of what essentially is the same or an almost identical toothbrush. The difference might well be the colour of the brush handle or the brush head that is included in the box. In this instance, they have released the Pro 6500 or as it may also be known the Oral-B Pro 6500 SmartSeries. The only difference that I am aware of is that that the 6500 comes with an extra brush head in the box. You get 2 brush heads in total, 1 x CrossAction and 1 x FlossAction. With the Pro 6000, you get just CorssAction, no FlossAction head. Multiple cleaning modes – 5 different modes for the most demanding of users and those with particular oral healthcare goals. Design – The same handle (different colour) of the Genius Pro 8000) for a stylish yet practical look and feel. Nicely finished and fairly slim in hand. Bluetooth connectivity – Connects to your smartphone for real time and historical tracking. Battery life – Offers a decent battery life thanks you the use of Lithium-Ion battery. SmartRing – Choose one of 12 colours to personalise the brush. Control it from the smartphone app. Pressure sensor – Get alerted to the times you are brushing too hard. A bright red illumination alerts you when you need to reduce pressure to avoid doing any damage. America Dental Association (ADA) approved – Passed strict lab tests to achieve ADA and American National Standards Institute-approved dental standards. Design – Only 4 of the 5 cleaning modes shown on the brush handle. To select alternative cleaning modes you must first switch the brush on. Bluetooth – Some will give up on it or not bother to use it. Conceptually great, many will find the benefits are outweighed by the hassle and need to connect to your phones. No wireless smart guide – A great accessory available with the Pro 7000, I think Oral-B have missed a trick here as I found this so useful. Battery life – Could be better. Competition exceed the 12 days on offer. Box contents – More brush heads and a smartphone stand should be included. Product evolution is important and the Pro 6000 is the next step in Oral-B design and features. The 6000 essentially takes the design and many of the features of the more premium Genius Pro 8000 and offers them at a more attractive price point. On the whole this is a positive thing, but there are a few negatives to be aware of. From the moment you take it out of the box it is obvious that this is a more premium model. It not only looks more appealing, it has neat touches to the design that make it more practical and user friendly. The body of the handle is primarily a gloss White colour with the main colour accent being the front of the brush with the silver/grey insert. This gives a perception of quality and an appeal that is not directed to men or women, it is a universally acceptable colour choice that will look at home in any bathroom. The brush handle is not perfectly round, sort of more like a rounded rectangle, but a final profile that feels good in the hand, even if the plastics are a little on the glossy side. It is at the front of the brush handle where things get a bit busy and you find all the main controls. The sides and the rear of the handle are free of such. The sides of the handle are a gloss white plastic, with the full rear of the brush being covered in a soft touch white rubber with circular impressions which helps the hand and fingers grip the handle. It is much more appealing brush to hold and grip onto compared to models like the Pro 1000 and 3000. Framed inside the silver/grey oval panel that runs almost the whole length of the handle is the power button, cleaning mode button, cleaning mode icons, Bluetooth and battery status. The power button, turns the brush on and off, that is all. Sounds logical. However on the likes of the Pro 3000 you use this same button to change the cleaning mode. On the Pro 6000 there is the cleaning mode button which when pressed changes the cleaning option you have selected. Both of these buttons are made of white rubber inset into the panel and both buttons are raised, making them easy to find. The power button is illuminated whilst the cleaning mode has a grey coloured arrow that points down. Both give a good feedback and are not too easily activated in error. It is worth knowing that the Pro 6000 does not allow you to select the cleaning mode prior to powering the brush on. It may not sound like a big deal, but what you need do is apply the paste, pop it in your mouth and remember how many presses of the cleaning mode button you need to get the right mode, to avoid toothpaste being thrown across the room. Why is is setup like this?! Brushes a fraction of this price have the facility to do this. Underneath the buttons are 4 icons which represent the 5 cleaning modes. Yes, 4 icons for 5 cleaning modes. They illuminate as the relevant cleaning mode is selected when you press the cleaning mode button. When illuminated a White light is used compared to the Blue light seen on the popular Pro 7000. We explain these in more detail in this post. Daily Clean does not get an icon on the brush handle. It is only when one of the other 4 modes are selected, does the relevant icon light up. I don’t understand why this is, it just seems a bit silly. Daily Clean is the standard go to mode and it is excellent, but you do have the choice of the other modes if you want them. They differ by the speed and number of movements of the brush head. The motor delivers different amounts of power. For example the Sensitive mode has a much lower number of oscillations and pulsations. If you do not feel you will use these additional cleaning modes then it is worth considering whether this brush is for you, you pay a premium for them. In the lower third of this front panel is a Bluetooth icon, a battery icon made up of 3 bars and then finally the Oral-B and Braun logos. The base of the brush is sealed, but has a recess into which the prong on the charging stand fits to charge the brush. On the neck of the brush is a plastic ring that runs the full 360 degrees around the handle. Known as the SmartRing, this is a LED panel that can be set one of 12 colours via the smartphone app. It also doubles up as the visual pressure sensor, more on this shortly. Then right at the top of the handle, protruding from the centre is a metal prong that delivers the movements to the detachable brush head. The brush handle is completely sealed making it water resistant so that is can be used in the shower if you choose. It is also fine to rinse off under a tap without issue. Do avoid submersion in water though. Supplied with the Pro 6000 is 1 CrossAction brush head that simply pushes on and pulls off of the brush handle. Small and compact you can generally get the brush head into all the hard to reach areas of the mouth. It cleans the teeth really well, the angled bristles sweep along the teeth and gumline effectively cleaning the plaque away and leaving your mouth much cleaner and healthier than a manual brush. The motion of the brush head on the Pro 6000, looks like this. The dynamic 3D movement helps adapt to your teeth as it oscillates, rotates and pulsates to break up and remove up to 100% more plaque than a manual toothbrush. I really like the clean offered by the 6000. The CrossAction brush head works well, but certain cleaning modes will work best with different brush heads. A range of alternative styles are available, but the Sensi Ultra Thin heads are perfect for the Sensitive or Gum Health modes, whilst the Pro White brush head works well with the Whitening mode. It would have been nice to see more heads included in the box. Not only to help demonstrate the ability of the brush and the other modes, but because the 6000 comes with a brush head storage compartment. This moulded plastic unit clips round the charging stands and holds up to 4 brush heads in a tray. There is a lid over the top that protects the heads from any dust, spray etc. This storage compartment is really useful if you use more than 1 brush head. You need to swap your brush head every 3 months for a new one, sooner if the bristles are frayed or split. All brush heads made by Oral-B feature something known as fading/indicator bristles. Blue in colour, over the 3 month period they fade in colour to a white/translucent colour, acting as a reminder to replace the head. What makes the 6000 pretty special is the connection to your smartphone that is on offer. It is not a new feature from Oral-B, but it is a feature that has improved in reliability and performance and is for the most part perfected here on the Pro 6000. The idea behind this connectivity is to essentially be a little like having a dentist or hygienist looking over your shoulder saying good, bad, brush for longer, you missed a bit. It is about education for better cleaning rather than telling you that you have got it all wrong. It is not there to nag you. Preventing any dental issues is much cheaper than resolving them, and often less painful. So you need to think of the coaching as being a positive thing and long term hopefully spending too much money with your dentist. The app will run on most Android or iOS devices. And uses Bluetooth on your phone and the Pro 6000 brush to pair. Your smartphone must have Bluetooth 4.0 as a minimum for compatibility. You can download the Oral-B app from iTunes or the Play Store. There are features like integration with your calendar so you can see your days agenda, news, tips and tricks, so you stay interested when cleaning your teeth. You don’t have to use the app at all if you don’t want to. Even if you do, you don’t have to use it all the time; the brush itself can store the data for up to 20 cleans. Whilst a toothbrush plays a vital role in oral hygiene the routine and way in which you clean does too. This app makes it easy to see and represent in real time just how good, or bad you are doing. Challenges are presented to you allowing you to obtain a score based on how well you brush and improve your habits. Brush better and for longer and you are on the road to success. Gain badges for achievements and share socially if you choose. If you have perfected your technique you may have less to gain than others, but I was impressed at just how well the app works and monitors you clean. I mentioned earlier about the LED Smart Ring that doubles up as a pressure sensor. Well from within the app you can set it on of 12 pre-programmed colours. It will shine this colour when is use, unless you are brushing too hard and the pressure sensor is activated, at this point it shines a brighter Red colour. If it is Red, this is not great and you need to relieve the pressure. The light is a visual clue you are brushing too hard. Brushing too hard over time can lead to gum recession and you want to avoid that if you can. Bristles of a brush head need only skim the tooth surface. Harder brushing does not mean a better clean. If using the app at the same time as brushing, the screen on the app will also illuminate red and tell you to reduce the pressure. Cleverly, the brush will too automatically reduce the brush head speed and stop the pulsation until the pressure is reduced. You may notice the sound of the motor change too. Added extras in the smartphone app include a Professional Guidance feature allows you and your dental professional to work together. Actually share and discuss improvement areas and have your dentist actually program into the app extra brushing time and adjustments to your cleaning modes. Online backup is another new feature. With an Oral-B account you can never lose data and even share with compatible services for additional insights and benefits. As the app logs data over the days and weeks, it is impressive to see through the logs how your habits and brushing time changes. The connection and transfer is fairly reliable and I have yet to run into any real problems. The Genius Pro 8000 does have one added feature, which is not available with the 6000 and that is enhanced tracking/position detection. What this does is uses the front facing camera on your smartphone to track the actual position of the Genius brush inside your mouth when in use. It takes this data and displays this on the smartphone screen, giving instant feedback to highlight and direct you to where you have missed and where you need to clean next. Good but not without its faults. I have found it a bit buggy, it is a bit awkward to use and you need to use a smartphone holder in your bathroom to hold the phone at head height, to actually do the tracking. A holder comes in the box, but it’s the type that you might have stuck to your car’s windshield. It is just odd in a bathroom. In all honesty the Pro 6000 gives excellent tracking, and the enhanced tracking on offer by the Genius Pro, whilst clever is not essential. It is also worth noting, whilst it is perfectly possible to share a brush handle, the handle can not differentiate between 2 users, so your data synced to the app will be wrong. If you both want to take advantage of Bluetooth connectivity, you need your own brush. If you are not a big smartphone user it might be difficult for you to get in a routine of using the app. In fact you might ignore the facility all together, that is fine (but is this brush for you?). If you smartphone is always attached to you, no doubt you will find it easier. Another oversight here in my mind is not including a stand of some form to hold your smartphone when brushing. If you want to encourage users to use the app, a small desktop stand would be a nice addition, otherwise you need to hold your phone in your hand or leave it on a worktop whilst you brush. A stand would position the phone nicely to show you the timer. Built in to any of the premium Oral-B brush is a timer, this is the bit of technology that makes sure you brush for the right amount of time, the required 2 minutes There is a quadpacer too. The idea is that you spend 30 seconds cleaning each quadrant of the mouth. Dental professionals usually break the mouth up into 4 sections, upper right, upper left, lower right and lower left. Spend 30 seconds cleaning the front, back and tops of the teeth in each section and you should be taking the right steps to achieve a good routine. When powered on the brush will at 30 second intervals will pause in the motion of the brush head to give you the notification you need to change quadrant. This continues at 30 second intervals, up until the 2 minutes, where you get 3 brief pauses in the brush head motion to tell you to stop. You should brush twice a day for 2 minutes each time. But do also be aware that the technique for brushing with an electric toothbrush is different to a manual brush, so make sure you are familiar with the right technique as this is almost as important. Now, whilst it is incredibly important that you find the right brush for you, you might be pleased to read that the Pro 6000 is an American Dental Association (ADA) approved electric toothbrush. To gain the ADA’s seal of approval the brush itself has been thoroughly tested and has had to pass strict lab tests set by the ADA and meet the American National Standards Institute-approved dental standards. An electric toothbrush with such credentials has been proven safe and have shown efficacy in removing plaque and helping to prevent and reduce gingivitis, when used as directed. If you want to read or know more, consult the ADA Seal report for Oral-B electric toothbrushes. Also included in the box is the all important charging stand. Made of plastic, there is a prong on the top, on which the Pro 6000 will sit to be recharged. This charger connects to the usual US mains power supply. It usually takes up to 12 hours to recharge the brush fully. It is a relatively slow charge that is pushed to the brush via the charging stand, so it is perfectly safe to leave the brush on here at all times when not in use. Good practice however is to run down the battery and recharge it every 6 months. I will speak more about the battery later in this review, but the brush offers 12 days of usage, which is ok, but not great. The only other item in the box, is a welcomed one. A travel case. Fairly basic it is made of plastic and is relatively thin. Its transparent and hold the brush handle and up to 2 brush heads. Whilst not being as robust or as premium as some other options, it certainly does the job and will protect the brush and heads when in a bag and stop accidental activation. Sadly, missing from the box is an accessory I loved, that comes with the Pro 7000, is the Smart Wireless Guide. It has essentially been replaced with the smartphone app. Essentially a portable clock and timer that shows your cleaning mode, how well you are brushing (via a smiley or sad face and star rating) and how long you have been brushing for. Powered by 2 AA batteries it could sit on a shelf or attach to a wall with an adhesive pad and was a small unobtrusive addition to the kit that worked well. It does nothing more than what the app does, but I believe a very convenient solution to encourage better cleaning when the app is not in use. Sadly though it is not included. Well built, Oral-B have a pretty decent track record of reliability so you should not have to worry about things going wrong. If they should the brush comes with a 2 year/24 month warranty to cover these issues. Whilst there is no denying that overall Oral-B make good electric toothbrushes, one of their weaknesses has to be battery life. The battery is important to allow the brush to be wireless, but really, given what Sonicare offer, the 12 days life offered by the Pro 6000 is not exactly great. Not bad, but it could be better. I get a little hung up on this, because although it is not majorly important it is nice to have the knowledge of knowing you need not charge all that often. Sonicare brushes last 2-3 weeks that is nearly double that of the Pro 6000. The Pro does use a Lithium-Ion battery compared to the Nickel Metal Hydride battery used in many other models. Lithium batteries are the same technology as used in your smartphone and boast an extended battery life compared to the NiMH batteries. The battery is built into the brush and is not user removable, as is the way with most brushes today. The Pro 6000 manages some 48 minutes of usage time on test with us. This equates to approx 12 days of real world use. This is based on one user brushing twice a day for 2 minutes on the standard Daily Clean mode. Personally I see battery life to be an important factor when it comes to choosing a toothbrush. Preferably I want it to last as long as possible without needing a charge. I like the idea of being able to go on a trip for as long as 2 weeks and not even need to worry about recharging the brush. But if I am going for this long I am likely taking a case, and the charging stand does not take up much space. I must also be considerate to the fact that there are sensors and extra tech for the position detection and Bluetooth connectivity. The reality is however, 95% of the time my brush lives at home within close range of the charging stand and there is no reason why it could not be charged more frequently, this is what most people do. You might not want to, but it is pretty safe to always leave the brush on the charging stand (supplied) being topped up. The charging dock itself is white in colour and has a small prong on the top which aligns with a recess in the bottom of the brush handle and will charge the brush fully in 12 hours. I tend to leave it on charge overnight. When charging the battery charging icon pulses with a white light. If the brush is completely flat, it will take 30 minutes or so before lights come on and it begins working again. Supporting 110v it will connect to the mains for power. When power is low in the brush, the battery status icon will flash and you will likely feel the decrease in brush power. When depleted completely the motor will power down and the battery icon flash red. Another minor criticism is that you never know quite how much power is left, is it 20%, 15%, you just have to gauge it off of the 3 bar indicator. It would be great it the battery status showed in the app, surely this is possible Oral-B? With a suggested retail price of $179-199 this brush is not cheap. Some retailers sell it at this price, but you will be pleased to know that many offer discounts, some as great as 40%. At the time of review at least 3 major retailers were selling the brush at around $115. We recommend checking out Amazon for competitive prices, and we’ve also included a live price comparison here. Despite not being cheap, it does boast quite a few features and is more cost effective than some alternatives. What you feel a brush is worth is personal; but given the other brushes on the market, what their prices are and what the sales are like, the price of around $115 is pretty much spot on and represents reasonable value I believe. If you are budget conscious, consider the Pro 1000. Prices do change and sometimes there are extra special deals to be hand, but I do not expect it to be available for less than $100. The Pro 6 like every other requires replacement brush heads for each user every 3 months. Replacement head packs vary in size and price, but as an average cost, expect a replacement head to work out at around $5 each. To try and compare different models, at Electric Teeth we try to price brushes over a 3 year period. It gives a benchmark cost. Using the average cost (based on one user) and ownership over 3 years the Pro 6000 will cost $170 or $0.16 per day to own. This price does exclude the cost of water, toothpaste and electric to charge it. There is a good chance the brush will last longer than the 3 year period and using the same brush handle but switching heads with other users in your household will only help bring the cost down and drive more value from it. I mentioned earlier in the review that Oral-B on the whole have a good track record with reliability. This is backed up be a 2 year warranty. Having had a good look over the Pro 6000 comparing it to other brushes there are no obvious issues or weak points. We like to test the brushes and we would always report if we felt there was an obvious weakness. Our tests do not involve scientific experiments or specialist stress testing. With a long history of production of electric brushes, the workmanship is high. Prolong the life of any brush by giving it a rinse and a wipe down to remove grime that builds up as well as regular discharge/recharging of the battery and you should be all good. A fantastic tooth cleaning experience is core to the Pro 6000. You will not be disappointed with the array of cleaning modes and how it performs on a daily basis. It looks smart, feels good in hand and pushes the connected toothbrush to the next level. It might not be for all but the Bluetooth connectivity and coaching will for some transform the approach and the general overall routine they have with their oral health, for the better. The battery life is better than many other brushes but really is worse than it should be, when you consider the competition and what other brands now offer. It would be advantageous to have a smartphone holder and extra brush heads in the box, but this is what makes the Genius Pro 8000 appealing. Is the Pro 6000 the best value toothbrush to buy? No. Does the Pro 6000 offer the best box contents? No. BUT, the 6000 is solid and if you want or need the extra cleaning modes and features it offers, then I doubt you will be disappointed. Is the Oral-B Pro 6000 an oscillating brush? A mode engineered to offer a polishing effect on the teeth as if you were at the dentist. Suitable for occasional or everyday use it works ideally with a Pro White brush head to make teeth look whiter and shine. No, the Pro 6000 has 5 cleaning modes. Daily Clean, Gum Care, Sensitive, Whitening and Pro-Clean. If you are looking for extra, the Genius Pro 8000 offers a 6th cleaning mode, tongue cleaning. With the Pro 6000 you get 1 brush head included, a Cross Action head. You can change the head with any others on offer from Oral-B. There are many that work with the brush handle. These options include Cross Action, Floss Action, Pro White/3D White, Sensitive/SensiClean, Precision Clean, Deep Sweep/TriZone, Dual Clean, Pro-Results, Power Tip and Ortho. Does the Pro 6000 have Bluetooth? Does the Pro 6000 come with a warranty & how long is it? If purchased new from an approved retailer the 6000 will come with a 2 year warranty. Does the Pro 6000 have a built in timer? Yes. Often referred to as the quadpacer or professional timer; subject to the cleaning mode the brush will provide an audible warning through a slight pause in the brushing mode to tell you to change quadrants. There are 4 quadrants to the mouth, and brushing is normally for 2 minutes. The timer will active at 30 second intervals, with a different sound at the end of the 2 minutes. The LED SmartRing will also illuminate to at 30 second intervals to notify you. Up to 48 minutes, or 12 days of usage time based on 2 cleans a day with 1 user lasting 2 minutes each time. No, the Pro 6000 is designed to work with an app on your smartphone, pairing via Bluetooth and therefore does not have a wireless smart guide included in the box. Older models including the Pro 7000 offers this. Yes. It actually comes with two. A traditional stand that forms part of the charging station and a travel case that has a power adapter for charging the brush in the case. The 6000 charging station or brush head holder has not been designed to be fixed to a wall. Can I use the Pro 6000 in the shower? Yes. The Pro 6000 is water resistant so if you choose you can use it in the shower. Avoid submerging the brush in water. How long does the Pro 6000 take to charge? A full charge takes up to 12 hours. When completely flat and out of power the 6000 will need at least 30 minutes on charge. What voltage does the charger support? The traditional charging stand supports voltages of 110v. Can the Pro 6000 be charged via a USB cable? No, this is not possible, if you want this facility check out the Philips Sonicare DiamondClean range. Is the Pro 6000 quieter than other brushes? No the 6000 is quite loud and no quieter than any other Oral-B electric toothbrush. Does the Oral-B app work with Windows Phones such as Nokia and Microsoft Lumias? No. Oral-B have produced the app for Apple iOS and Google Android only. There is currently no application suitable for those with Microsoft Windows phones or any other mobile platform. Is the battery in the Pro 6000 replaceable? No, the battery is built in. Whilst technically it could be replaced it would void the warranty and is not advised. Do you own or have you used the Oral-B Pro 6000? what is the year this oral-b-pro-6000 first was sold to public or manufacturer date? Nick, I believe it was first sold in late 2016, approximately September/October 2016.